The Dothraki come from a land (Essos) that is east of Westeros, and separated by the Narrow Sea. But the map given in the book (A Game of Thrones) doesn't show anything beyond Dragonstone. Is there a reason for this? I would speculate that it is because - I believe - ASOIAF is largely inspired by War of the Roses, and Great Britain in general. 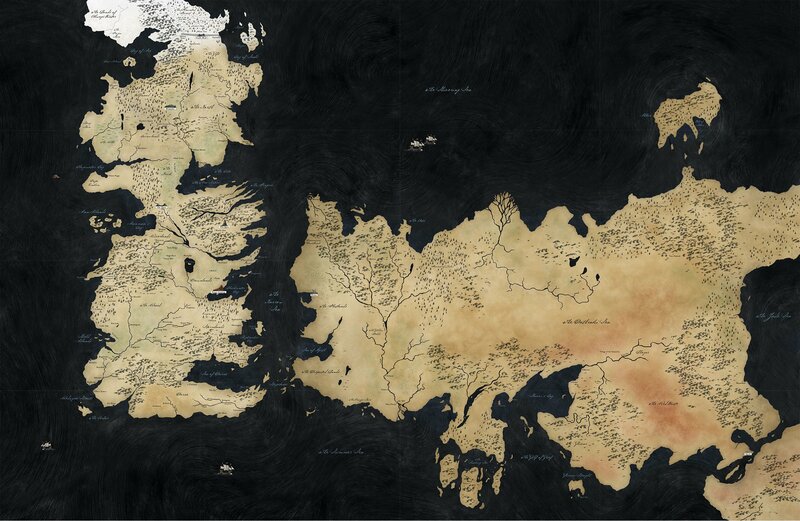 If you look at the map of Westeros, you will notice a certain resemblance to the British isles. The War of the Roses' is the war between the houses Lancaster (red rose) and York (white rose), which is rather a good match for house Lannister and Stark, down to the color. Even the location of the city Lancaster is similar to the location of Casterly Rock. We have also have titles, e.g. Lords, knights (called "Ser"), tourneys, which are all words of English origin. When you scan a map of England with an eye for ASOIAF details, you will notice many similarities, in shape, location of cities, rivers/bays, etc. American author George R. R. Martin has acknowledged that Hadrian's Wall was the inspiration for the wall in his A Song of Ice and Fire series. With all this in mind, it is easy to imagine that GRRM can easily picture Westeros, whereas Essos remains more abstract. Given that the series was at first meant to be a trilogy, it is not even certain that he ever gave Essos much thought, until, of course, the series grew and expanded. And I believe this is the reason we do not have better maps of Essos. I do not believe we will ever see very detailed maps of Essos in ASOIAF. I think the focus of the series will soon be shifted entirely to Westeros, and also, I think that there is too much focus on scrutinizing GRRMs works for him to have the possibility to sift through all his books and lock down all the details. Personally, though, I am very interested in seeing a proper map of Valyria and the surrounding areas, to see their empire as it was during their reign. I think the simple answer is because that's all they chose to publish and that's all that is largely relevant in the first few books. A Dance with Dragons contains much more extensive maps including maps of Valyria and the Free Cities (some of these can even be viewed on Amazon) because a lot more of the action is taking part beyond the Narrow Sea. complete map of the known world, joining the lands of the Seven Kingdoms and the lands across the Narrow Sea for the first time in series history. The question would therefore be answered as either "because Martin wanted to sell this book" or the less cynical "because they didn't have room for irrelevant-ish details". At the Town Hall lecture in Seattle last Tuesday (7/3/12), GRRM addressed this. He had sketched a crude map of the East, and since he didn't have any plot lines occurring there, he didn't worry about detail. Now the publishers are working on a compendium of completed maps, which he has fleshed out for rendering by actual artists. He confessed to being a poor artist and mapmaker and remarked that the map book, which was not supposed to impose on his time, had in fact, taken a lot of time. The whole WORLD? No, definitely not. No European map of the middle ages could possibly have included the Americas or Australia, and even their ideas of China (Cathay) and India were rather... ah, inaccurate. The regions where the action takes place, through which the characters move? Yes. I doubt there's a reason beyond because Martin hadn't finalised that part of the world yet and because most of the story takes place in Westeros. 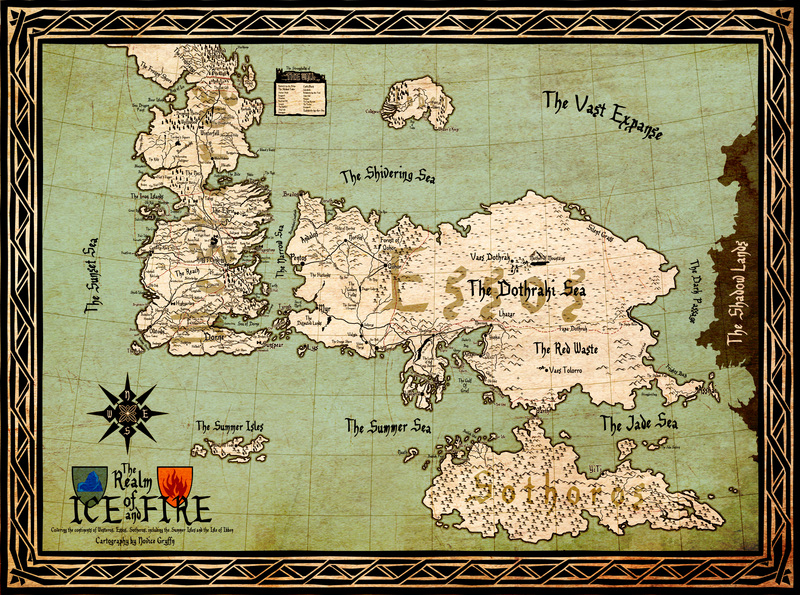 However, we now have a map of The Known World in The Lands of Ice and Fire, a series of maps that represent the only canon maps of the world. 1.) GRRM deliberately left out concrete details of where things were located outside of Westeros because he wanted the readers to feel like the characters in the novel. In Westeros, the names Yunkai, Qarth, Yi Ti, and Asshai sound foreign and exotic. To the characters, these are far away places that they will only ever be able to dream of. They only know that they are 'to the east' somewhere, and very far away. Likewise, the readers are kept in the same type of suspense and wonder. As the series progresses, however, we get to know more of the world. More and more maps are included in the appendices, so we feel like we gain more knowledge of GRRM's world as we get further into the series. 2.) GRRM began the series over a decade ago. During that time he probably had no idea where things would wind up, or where each character's plotline would lead them. It is more likely that the maps developed around the plot, not the other way around. This is probably why A Dance with Dragons had the most detailed maps - the locations had finally been established, and GRRM could illustrate with some accuracy where everything was in relation to each other. 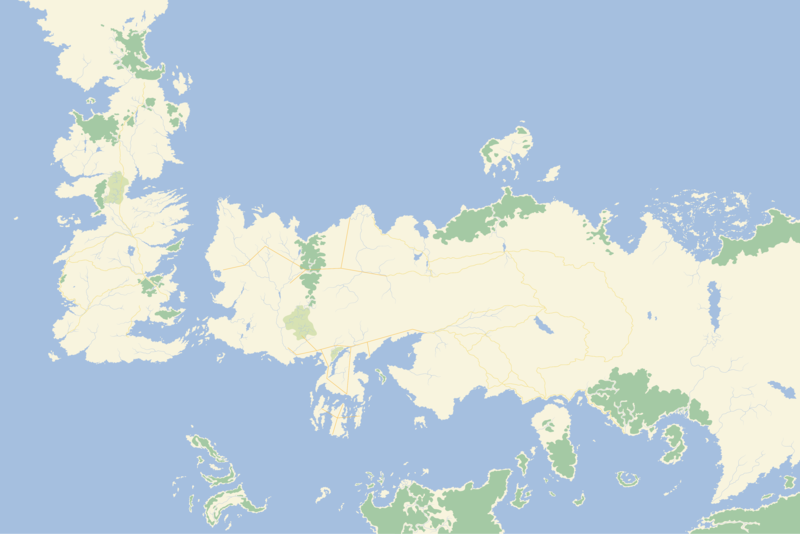 That being said, there are dozens of fan-made maps online that reveal the entire world of ASOIAF, including not just Westeros and Essos but the Summer Isles and Sothoros (which has barely even been mentioned in the books). Many fan-made maps even include speculations about the estimated location of Asshai, Yunkai, etc., even though no official GRRM map has come out showing us their location yet. Of course, you'll notice that all of the maps differ just slightly in their interpretation of Essos and especially the lands even further south and east. Most of the areas are in roughly the same place, but the details are all a bit off. Again, this is deliberate - GRRM's use of the "unreliable narrator" technique make us aware that our knowledge of the world is limited by what people tell us, and that the less familiar information becomes, the more likely it is going to contain inaccuracies, exaggerations, and misinterpretations. 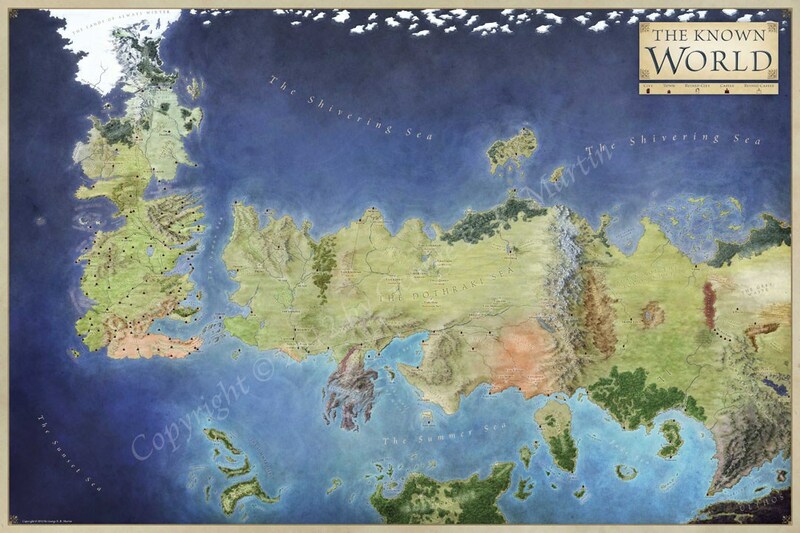 Standard map of the whole realm with all cities in Game of Thrones? With all the wealth and black magic across the sea in Essos why, can't they just take over Westeros? Are there in-universe reasons reason why Dany wouldn't start her conquest in Dorne? Was the rescue in Episode 6 “Beyond the Wall” achieved in a plausible time?